Fall and Winter are my two favourite seasons. They bring with them the best holiday parties and family get togethers. These are the times when sweaters come out of storage, leaves turn gold with change, Starbucks releases their festive drinks, and you can rock a plum lip without any judgment. The holidays are an excuse to pamper yourself, break out that new eye shadow, and put on that special dress you’ve put aside to kick off the party season. You want to look and feel your best when you reunite with family from near and far, so here’s my hair care guide (inspired by my own research and some of the industry’s best hair stylists) to get you through the curlings, sprayings and backcombings of the holidays. Thanksgiving is this weekend after all (in Canada that is). 1. Apply the shampoo only to the roots of your hair; this will help avoid drying out your ends. 2. 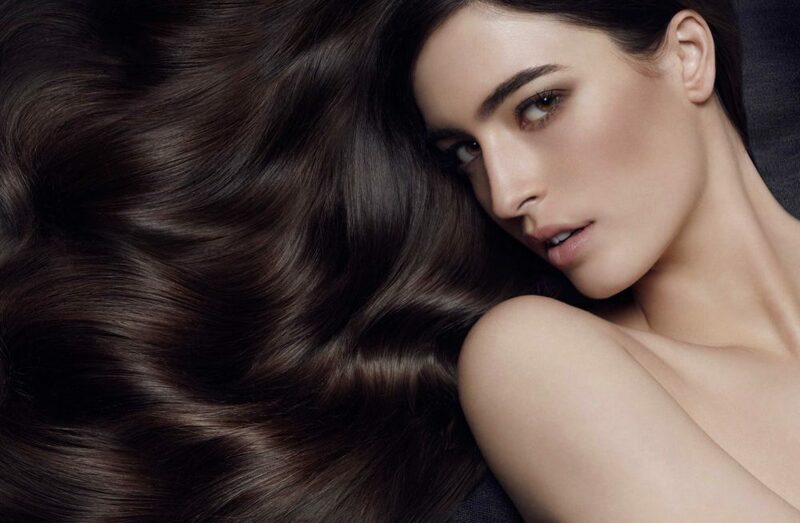 Apply conditioner from your mid-lengths to your ends; this will help avoid making your scalp greasy. 3. Rinse your conditioner out with cold water. This is possibly the most difficult thing to accomplish, I mean, who wants to be doused with cold water? But this is supposed to close the hair cuticle and help to minimize any frizz once your hair dries. It really does make your hair all silky and shiny. Each hair type will need a different shampoo and conditioner, but here are the products that work best for my hair (normal to fine and lots of it). 1. Kai Shampoo and Conditioner, Kai products do not come cheap, but oh my goodness do they smell good. I was first introduced to the line at the Grand Wailea in Maui, Hawaii – so obviously I knew right away that these products were the best of the best. A little goes a long way with the formula for both the shampoo and conditioner, so I was pleasantly surprised with how much bang I got for my buck. I’m someone who when the conditioner bottle says use a nickel sized amount uses about $10 worth, and I only need about a toonie sized dollop with this Kai conditioner. The shampoo and conditioner are paraben, sulfate, phthalate, phosphate, and cruelty free. They also come in recyclable packaging! I love a good hair mask, I use one all the time during the cold weather months. They’re a great way to strengthen your hair after all the abuse you put it through, so if you’ve done that hollywood wave at a few too many parties THIS is how you can fix the damage (second best to chopping it all off, but who wants to do that). 1. Nounou Pak by Davines, I am obsessed with this hair mask. It’s so effective I can’t imagine finding a better one. You apply the product on washed damp hair and leave in for 10 to 15 minutes, comb through, then rinse. The cherry oil, olive butter and rhizobian gum work wonders for your mane, leaving it silky, nourished, and moisturized. 1. Apply a hydrating product. This is usually leave in conditioner for me. I apply it to the ends of my hair and either let my hair air dry or blow dry to 80% dry. 2. Apply a base. This is when you apply a mousse, or something to either give your hair texture or volume. I don’t actually follow this rule unless I’m putting a lot of effort into a hair style. I’ll often use a glossing cream or a blow dry cream at this point instead if I’m keeping my locks long and casual. Then continue to dry your hair and use your hot tools as desired. 3. Apply your finishing products. These can be hairsprays for styled looks, sea-salt sprays for beachy texture, or a shine serum/oil to tame dry and frizzy hairs. Unless I’m rocking a ponytail, I avoid hairspray and I’ll use oil or shine serum instead. Here are my favourite products to keep my signature hairstyle looking low maintenance, silky, natural, and straight despite the damage it’s faced. 1. Aveda Damage Remedy Daily Hair Repair, I love the scent of all Aveda products, and this one is no exception. This leave in conditioner uses certified organically-derived quinoa protein to penetrate the hair to instantly repair damage and strengthen from the inside out. I listen to the instructions for this one and only apply a small amount to my ends, then I brush through. 2. Fekkai Brilliant Glossing Crème, The brand name gives this product its credibility, but there’s a reason it’s award winning. I apply this product religiously and love the silky finish it gives. It transforms hair into this glossy blanket, yet keeps it manageable and luxuriously soft and touchable. I also love the fresh scent. 3. Carol’s Daughter Chocolat Smoothing Blow Dry Cream, You really want to listen to the directions on this one. A dime sized amount is all you need. I like to apply this to my ends and work my way up to the roots so I have less product when I reach them. This is a great product for transforming your hair into a mink-like mane by controlling hair during blow-dry and flat-iron styling while protecting against heat damage. 4. Agave Healing Oil Treatment, After I blow dry and straighten or curl, I apply oil to my ends to smooth out any frizzies. I seriously believe that this agave oil is the best oil for hair – I find it doesn’t ever leave my hair looking oily, and it provides just the right amount of moisture to revitalize my over worked ends. The best part about this plant oil is that it heals and restores your hair as well as immediately transforms it. The natural botanicals like coconut, vanilla, sunflower, and safflower are blended with madagascar baobab seed oil to nourish hair’s outer layer. 5. Living Proof Satin Hair Serum, Day two hair can sometimes require a bit of help. The elements, the toss and turn in your sleep, and the unavoidable tangles can sometimes leave my hair looking frazzled. This product is always the answer for less than perfect hair. It’s an oil-free and silicone- free serum, so I’ll even apply it to the baby hairs that frame my face. The incredible smell doesn’t hurt either. At the end of the day we all just want healthy hair, and to achieve that less really is more. By avoiding heat when you can, but also using the right products when you need to, you can keep your tresses looking their best.